Some of the most magnificent royal jewels in the world reside in the collections of a trio of Danish royal sisters: Queen Margrethe II of Denmark (our current Magpie of the Month! ), Queen Anne-Marie of Greece, and Benedikte, Princess of Sayn-Wittgenstein-Berleburg. 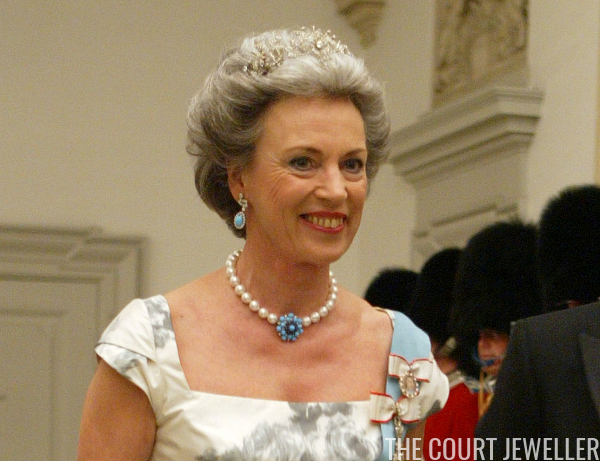 Today, we're focusing on Benedikte's diamond floral tiara, which she received as a coming-of-age birthday gift. 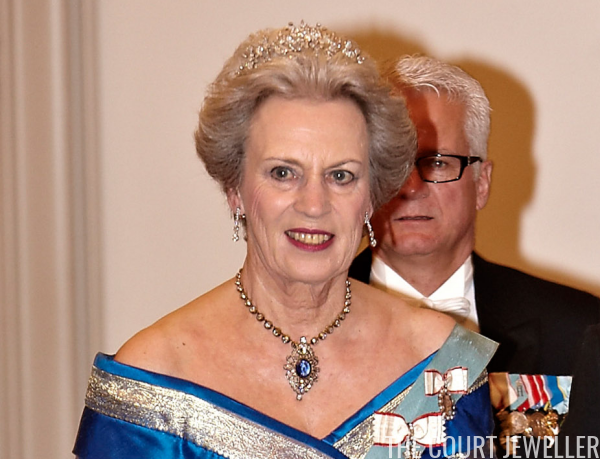 Alexandrine left the floral brooch to Queen Ingrid, who supplemented it with additional diamond elements to form this tiara for Benedikte. The original brooch makes up the center of the reworked piece. Additionally, the diamond that forms the heart of the central floral element can be swapped out for an emerald. Versatile! And even better, the brooch can still be removed from the tiara and worn separately. 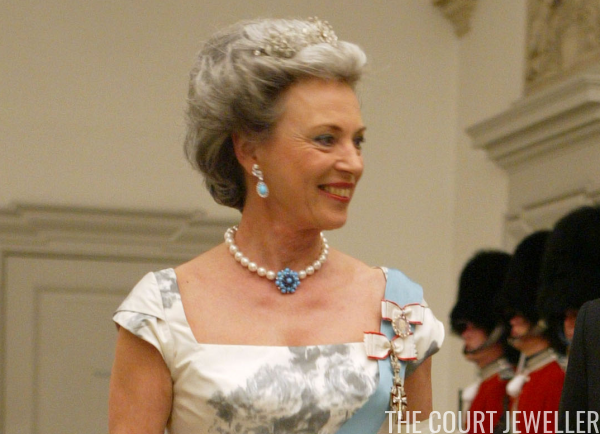 In March 2012, Benedikte wore the brooch pinned to her gown during a visit from the Prince of Wales and the Duchess of Cornwall. 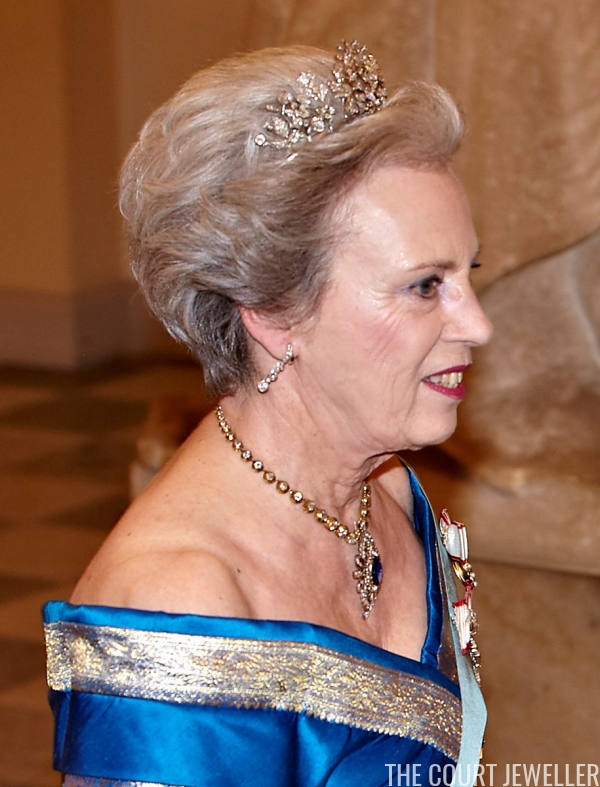 Benedikte has been wearing the tiara since she received it from her parents as an eighteenth-birthday gift in 1962. Although Benedikte was never destined to be a queen (or a queen consort) like her sisters, she has attended numerous high-profile state events throughout her life. An early appearance for the tiara came in April 1964, when she made a visit with her parents to the Vatican. For the May 2008 wedding of another cousin, Prince Joachim of Denmark, Alexandra wore the tiara with additional diamond accessories and a very sparkly sequinned wrap. Even though the SWBs are minor royals, Benedikte is still an important part of the Danish royal family. 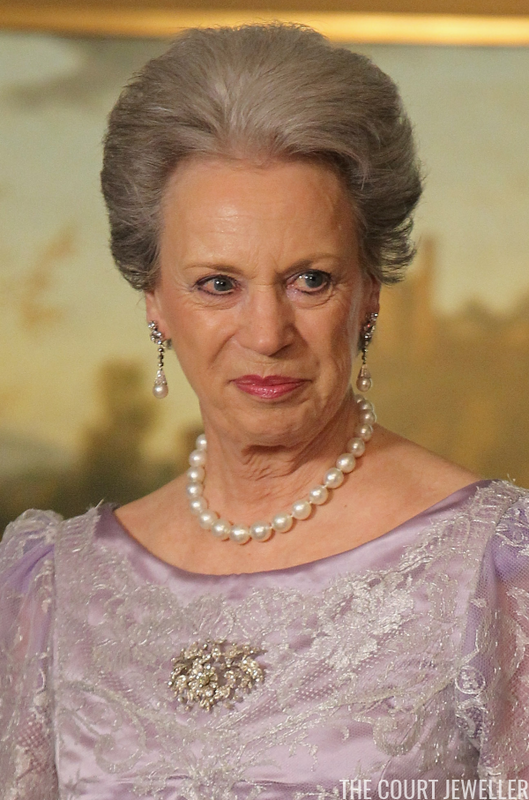 She even serves as one of the formal regents for the country; if the queen and the crown prince both leave the country, another family member -- Princess Benedikte, Prince Joachim, or Princess Elisabeth -- has to stay behind and act as temporary regent. 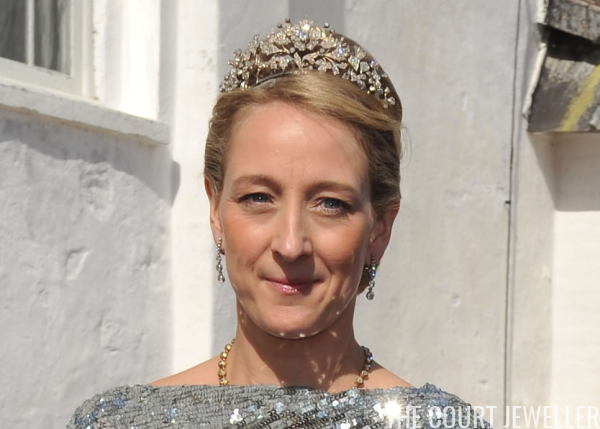 Thankfully, Benedikte's continuing closeness with her Danish family means that we see all of the Sayn-Wittgenstein-Berleburg ladies sparkling at tiara events quite regularly.